For your relaxation, enjoy the beautiful outdoor pool on the lake and a private access directly on the lake. They will also have free access to the children's playground with inflatable castle in summer, the volleyball field and multisports. For petanque enthusiasts, 2 boulodromes are available in the area. Supervised by animators, they can participate in various activities: DIY, water games, theme days, shows ... for about 4 hours / day from Monday to Friday. 3 room chalet of about 30m² for up to 4 people. 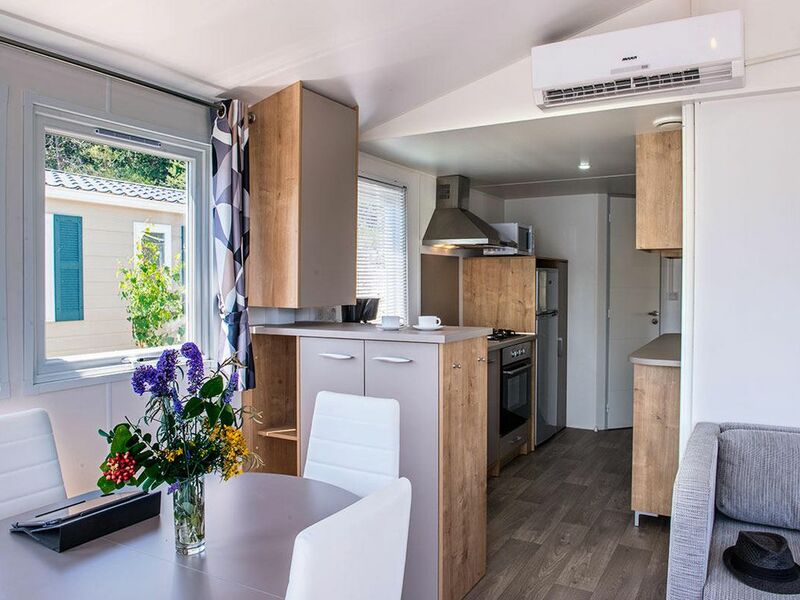 It consists of a living room with sitting area and dining area, a kitchen, a bedroom with 2 single beds (90cm), a bedroom with 1 double bed (140cm) and a bathroom with shower and separate WC. The kitchen area is equipped with a fridge, 4 hotplates, a coffee maker, a microwave and a dishwasher. Utensils and crockery for 4 people. The chalet also includes: reversible air conditioning and a flat-screen TV.